Corfu City Pass as long as Single Attraction Tickets cannot be cancelled or refunded after their purchase. Although the name of the customer/buyer is writen on the Corfu City Pass and the Single Attraction Vouchers, they both can be used by other persons, always in accordance to the tickets rules. The Voucher’s validity period is determined by each attraction’s working period. For more information concerning attractions’ working period please refer to the Attractions & Actinities Section. In order for the Corfu City Pass and Single Attraction Tickets owners to secure their free entrance to each Attraction & Activity they should have a printed or digital copy of their vouchers at the date of their visit. Vouchers are available for download from the corfucitypass.com website with the completion of the payment process. Moreover all Vouchers are send by email to the customer at the email address specified during the purchase procedure. Each Voucher can be used only once and only during its validity period as this is mentioned on it. Vouchers owners are entitled to free entrance and free use of services as those are mentioned on the Voucher. All Attractions & Activities who cooperate with the corfucitypass.com are obliged, through their contract with the corfucitypass.com, to offer free access to the Voucher owners. CorfuCityPass.com holds no responsibility in case of any acciddents take place in the residences of any attraction or activity, before, during or after the customer’s visit to it. CorfuCityPass.com will make every rational effort to offer to its customers facilitations and discounts for the entrance and services offered by the cooperative attractions & activities, but in no case holds responsibility if any of the service providers, illegally, in contradiction to the contract’s rules and without any serious reason, deniew free entrance and rendering of services, in one of the vouchers’s owners.Purchase & Use of Corfu City Pass & Single Attraction Tickets. All the above mentioned and any compensation claim should be submitted to the involved provider. Corfu City Pass Child Ticket can be used by children of ages between 5 and 12 years old. In all attractions entrance for children between 0 and 4 years old is free of charge. Single Attractions Child Tickets can be used according to what is mentioned on the Rules & Conditions section of each product. Payment for the Corfu City Pass and Single Attraction Tickets can be fulfilled only through the use of credit or debit card of the following types (VISA, MASTERCARD, MAESTRO). The full order’s value is credited to the buyer’s credit or debit card during the completion of the payment procedure. 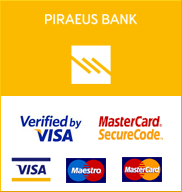 The transaction takes place in the secure digital environment of the Bank of Piraeus. CorfuCityPass.com does not save or collect information concerning the buyer’s credit or debit card. In case you are not an owner of the above mentioned cards you can contact us in order to arrange a direct bank transfer. CorfuCityPass.com holds no responsibility for the quality of services offered by each provider, the conditions, the security and any possible failure of the offered services. Corfu City Pass and Single Attraction Vouchers owners, who bought them from 01-04-2019 to 13-10-2019 can use them in each Attraction & Activity according to the working days and hours. The above mentioned working days and hours are the ones mentioned in the contracts signed between CorfuCityPass.com and the service providers. CorfuCityPass.com holds no responsibility for possible changes in the period and the working hours made by the service providers. All complaints and compensation claims for any loss, damage or discomfort caused due to those changes should be submitted to the involved provider. Especially for the attractions & activities in which weather conditions can affect the provision of services, Corfu City Pass and Single Attractions tickets owners should keep in mind that the hold no rights for compensation claim in case of services stoppage due to weather conditions. In any case ticket owners can use their tickets at any time during their validity period. Although CorfuCityPass.com has put all the necessary effort and actions in order to secure the integrity and correctness of the given, through this website, information, it holda no responsibility for any loss, damage or discomfort may be caused due to use of those information. Users make use of information at their own responsibility. CorfuCityPass.com bounds to protect your personal information, which may be used only in legal manner. We collect information which you choose to share, through your contact with us via email or other means and also through the products order procedure. Moreover we collect aggregate information for your visit in corfucitypass.com. These information concern demographic data and browsing attitude and thus they cannot be used to identify you. We keep archives with email accounts for marketing purposes concerning our products and services, and for service providing purposes. In any case our customers have the right to delete their email from our marketing list, by clicking the “Unsubscribe from list” link, that they will fing in one of our emails. We might use technological means in order to follow the browsing behavior of our website’s visitors. These action might include the use of “cookies”, which are stored in your browser. Usually you can change the settings of your browser in order to avoid such action. Information collected through this procedure can be used to identify you, unless you change your browser settings. If you access the corfucitypass.com websitee or any other site created by CorfuCityPass.com you agree to be bound by the conditions refered to the currect legal notice. The copyright in the material contained in the corfucitypass.com website belongs to CorfuCityPass.com. Except solely for your own personal and non commercial use no part of this website may be copied, broadcast or adapted without the prior written permission of CorfuCityPass.com. CorfuCityPass.com assumes no responsibility for the contents of any other web sites to which the corfucitypass.com website has links. To the extent permitted by law CorfuCityPass.com shall not be liable to any person for any loss or damage which may arise from the use of any of the information contained in this website. With the purchase of the Corfu City Pass and Single Attraction Tickets the customer bounds to currect Terms & Conditions.